This topic contains 8 replies, has 4 voices, and was last updated by Reaper 12/02/2018 at 11:24 am. First time sharpening D2 on the wicked edge system. Markered the blade found the sweet spot matched the angle on both sides and went through the stones finished with ceramic and I am very happy with the edge. That’s all that really matters is that your happy with the results. What angle did it match at? D2 steel has a wide range of hardness, from 55 to 62, on the Rockwell C scale, depending on how it was hardened and tempered. So the steel could be from what would be considered soft to pretty hard on the other end of the scale. I’ll be curious to see how it stands the test of time and use. The angle was pretty close to 20 degrees per side 20.35 on one side and 20.45 on the other chose to go with 20 degrees. 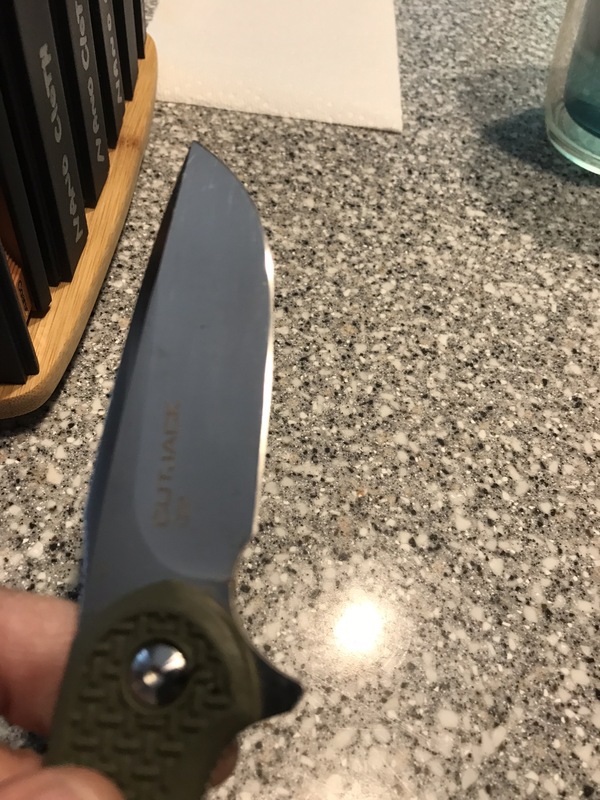 I EDC this knife in rotation for work everyday and have found I like the 20 degree angle for cutting of shrink wrap and cordage that I cut everyday. The steel will is not expensive but being knew to the WE system I wanted to try sharpening D2 on an inexpensive blade. As my confidence gets better I will move up to the lapping and polishing as you much more experienced gentlemen do. I would also like to thank all the members that are willing to give me the benefit of their experience. I am glad I found this site. You are willing to share your knowledge without hesitation no matter how simple the question. That’s a great looking bevel Travis! You did a good job clamping the blade in the sweet spot as evidenced by the even bevel width across the length of the blade.